The sophistication of the craftsmanship, design, materials, and numerous motifs seen in this Canopy Bed is an indication that furniture of great beauty and refinement was still produced in the 18th century. It is rare to find a six-post canopy bed of chi-ch’ ih-mu wood in such fine condition from this period. 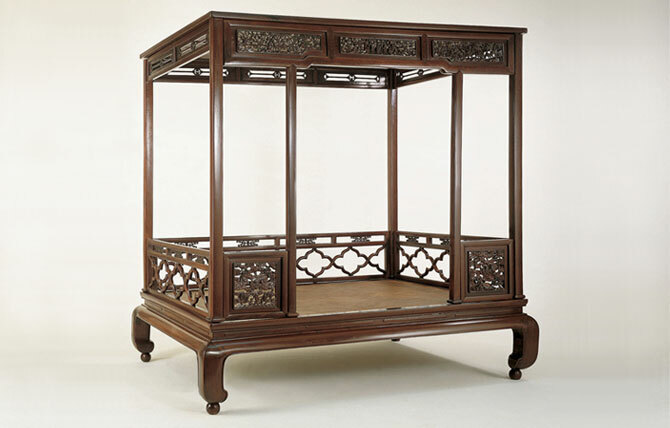 Dr. Sarah Handler describes this Canopy Bed in Ming Furniture In The Light Of Chinese Architecture on pages 82 to 86: “Made from old jichi wood, this magnificent bed is an example of the sophisticated refinement found in the best pieces of eighteenth-century furniture. Jichi is known as ‘chicken-wing’ because when cut tangentially the fine grain pattern of alternating purplish-brown and yellowish lines resembles the feathers near the neck and wings of a chicken. The trees grow in Hainan, Hubei, and Sichuan. Especially popular in Fujian during the late Qing dynasty for furniture making, the feathery grain forms interesting patterns on the wood of this bed that, over the centuries, has developed a rich coffee-colored hue. The members are substantial with rounded edges and slightly convex surfaces. This lavish use of material and the quality and complexity of the carving indicate an expensive bed that would have given great status to its owner. The sharply outward-jutting bead along the apron, the separate double-molded piece of wood between apron and waist, and the raised panels on the recessed waist all indicate a Qing dynasty date. The back and sides railing have a bold quatrefoil lattice design, an abstraction that may appear to be floral in origin, but which certainly had connotations of clouds, ruyi wish-fulfilling scepters, and lingzhi fungi of immortality. Their minimal design provides an effective foil to the dense and elaborate motifs in the struts and front railings. The complex abstraction of the struts with its hints of ancient dragon motifs is characteristic of the Qianlong period and is also found on ceramics and jades. The front railing panels are carved with an undulating layered surface that gives a three-dimensional appearance to the bats flying in the clouds. Bats are auspicious creatures and the five bats represent the Five Blessings --long life, riches, wealth, love of virtue, and a natural death. The bat descending from clouds symbolizes ‘blessings descending from heaven’. Each panel has a rock formation along its lower edge; in one the rock rises from waves and thus clearly represents the Isle of the Immortals rising from the Eastern Sea.